Google Home is about to get a lot bigger, according to tips from two sources speaking to 9to5Google. Maybe it’s ready to raise a family, and just can’t deal with the smaller space of the current Home. The new smart speaker is currently being called the Google Home “Max,” though that will likely change when (and if) it’s officially unveiled at Google’s upcoming October 4 event. Unfortunately, we don’t know much about the Google Home Max other than the fact that it (probably) exists, will be higher-end than the current Home, and that’ll feature stereo sound. 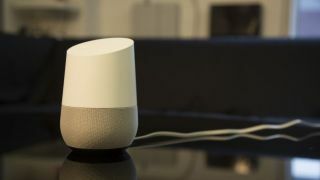 But that feature alone likely means Google intends for it to serve as an alternative to the Amazon Echo, which just received a second-generation update earlier today. For Amazon, the leak of the Max probably feels like a little more salt rubbed in the wound in the wake of the recent news that Google cut off YouTube access for Amazon's video-focused Echo Show. For that matter, the Google Home Max looks as though it will compete with high-end speakers like those from Sonos and Apple’s highly anticipated HomePod, both of which feature high-quality music playback and an attractive design. The leak is but one of many we’ve seen ahead of Google’s rapidly approaching event next week. Earlier rumors, for instance, suggested that Google wants to go small as well as large, as one of the rumored devices is the Google Home Mini. Unlike the so-called Max, which appears to place a specific emphasis on audio quality, the Mini is aimed more at folks who want access to Google Assistant above all else. It’s essentially what the Amazon Echo Dot is to the Amazon Echo. Google is also expected to unveil two new versions of the its smartphone, namely the Pixel 2, as well as a Pixelbook 2-in-1 laptop that runs on Chrome OS.